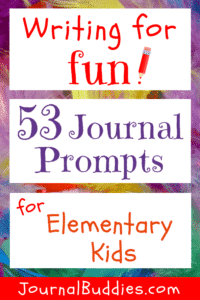 Writing for Fun: 53 Journal Prompts for Elementary Students— When you’re looking for a way to inspire creativity in your students, there’s no better way to get their minds going than through journal prompts. With writing prompts, a simple question yields endless possibilities and offers each student an opportunity to express his or her individuality. Though your students might not always have the answers, they’ll quickly learn that there is no right or wrong response, especially when writing for fun. Instead, they’ll feel encouraged to write about subjects close to their hearts and to explore their feelings on all sorts of topics. 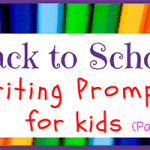 These 53 new writing for fun prompts for kids encourage creativity and promote fun. From dreaming about the future to reflecting on the things they’ve learned, students will cover plenty of ground while answering these questions. Light-hearted prompts that require imagination balance well with deeper, thought-provoking questions about emotions and experiences. Students will love receiving a question each day and finding something new to think about! Whether your students have written one journal entry or 100 journal entries, the practice of daily writing can have a positive impact on their lives. 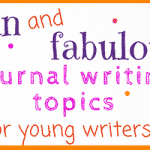 Ok, without further ado, here are those writing for fun journal starters for elementary students! Do you get an allowance? How does it work? Write a story about life in 2512. Do you believe that wishes come true? Is it better to have older siblings or younger siblings? Write a story about a singer who can’t stop singing. How do you feel when you play with your friends? What is the first thing you do each day? Think of something kind you could for another person today. If you could throw a party for the entire school, what would it be like? What is the most important thing you’ve learned so far this year? Have you ever saved up for a large purchase? How did you feel when you’d saved enough? 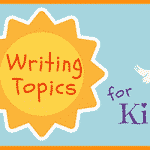 Write a story about a magical tree. How can you be a role model for younger students? How does it feel when someone thanks you? What would it be like to celebrate something every day? What age are you most excited to reach? What does it feel like to apologize? 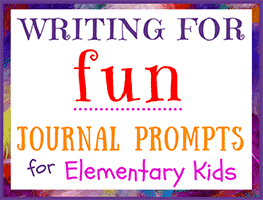 Write a story about an adventurous anteater. Why is school important to you? Do you ever have trouble sharing? What is your favorite thing about your parents? Have you ever volunteered or donated something? How did you feel afterward? Would you rather have one long summer vacation or several short breaks during the year? Is school too easy or too hard for you? Why or why not? How does it feel to win at something you’ve practiced? Imagine your life as an adult. What would you do all day? Write a poem about your family. Why is it important to share with others? Would you rather be really tall or really small? Write a poem about your favorite thing to do. Are you friends with boys and girls? Why or why not? What is your favorite color? Has it changed since you were younger? What is the best part of the school day? Write a letter to your best friend that says something nice about him or her. Create a new version of a popular sport. What would it be like to live in a house made of desserts? If you could pick one new thing to have on the playground, what would you choose? Write about your dream house. What would be inside? Write a story about a kid who can’t stop growing. 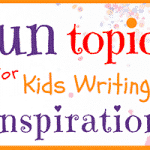 Whether your students need a break from memorization or they could simply use a fun opportunity for creativity, these fun writing prompts for kids are sure to do the trick. Get started today and watch as imaginations are stretched to new limits!